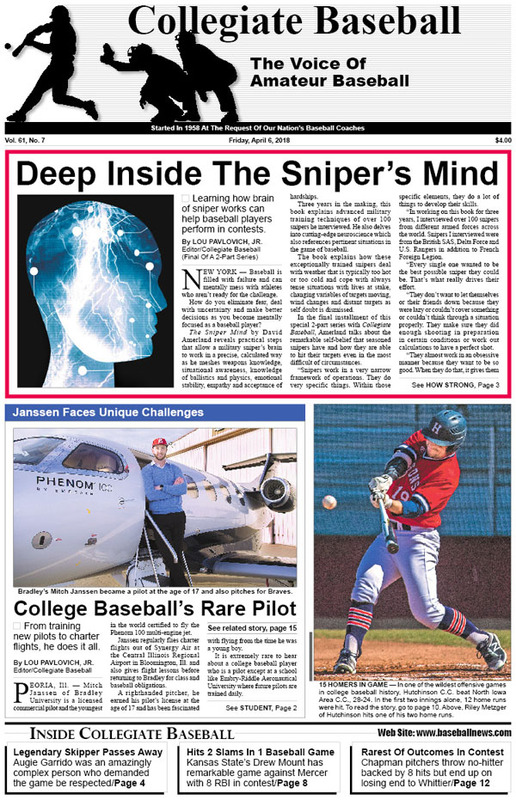 • Deep Inside The Sniper’s Mind: David Amerland explains why learning how brain of sniper works can help baseball players perform in contests. • College Baseball’s Rare Pilot: Bradley’s Mitch Janssen is the youngest pilot in the world certified to fly the Phenom 100 multi-engine jet..
• 15 Homers In 1 Game: In one of the wildest baseball games in college baseball history, Hutchinson C.C. and North Iowa Area C.C. lock up in a slugfest won by Hutchinson, 28-24 which heads up our junior college notes. • Legendary Skipper Passes Away: Augie Garrido was an amazingly complex person who demanded the game be respected. • Editorial: Training the mind in baseball is highly important but not worked on nearly enough. • New $50 Million Baseball Stadium: University of Florida announces plans to build a remarkable new stadium with an overall capacity of 10,000 that will start construction in the fall of 2018 with a completion goal prior to the 2020 season. • Collegiate Baseball’s NCAA Div. I Top 30 Poll Presented By Big League Chew: Oregon State No. 1 as Beavers only allow 4 stolen bases in 22 games and roll to 20-2 record. • Collegiate Baseball’s National Players Of The Week: Kevin Strohschein of Tennessee Tech. leads the way with 4 homers, 10 RBI and 7 runs scored over 4 games while RHP Jake Lee of Oakland tosses a 1-hitter with 14 strikeouts, among other incredible achievements. • NCAA Div. I Notes: Kansas State’s Drew Mount becomes first Wildcat player to hit 2 grand slams in a game since 1994 during a 12-3 win over Mercer. Plus, Pittsburgh’s unique Home Run Helmet and how Ball State’s Jeff Riedel tied an NCAA record with 5 doubles in a game, plus much more. • NCAA Div. 2 Notes: Tarleton State’s Francisco Rodriguez has a weekend for the ages as he kicks it off with a 5-for-5 performance, including 3 home runs in his first 3 at-bats of the series, plus much more. • NCAA Div. 3 Notes: Despite no-hitter backed by 8 hits, Chapman loses, 2-0 to Whitter in a bizarre game only seen in baseball, plus much more. • Ruleball With Rich Marazzi: Double-switch, substitutions can cause problems for coaches. • NAIA Notes: Kiki Menendez belts 8 home runs with 24 RBI over 5-game stretch, Austin Kuchinski of Central Baptist belts 6 home runs over the final two contests of a 3-game series against Hanibal-LaGrange, plus much more. • Collegiate Baseball’s National High School Top 30 Poll: Lake Travis (Austin, TX) rolls to 17-0 record while Notre Dame (Sherman Oaks, CA) is No. 2 at 11-0, plus much more. • High School Notes: Josh Hall of Homewood High School sets Alabama career record with his 165th stolen base, plus more. • Studying Fighter Pilots: Pitchers, fighter pilots have interesting similarities says former Stanford pitcher Matt Manship. He learned to land jets on aircraft carriers in total darkness and has flown F/A-18F Super Hornets which have a top speed of 1,190 mph. To purchase the April 6, 2018 edition of Collegiate Baseball or subscribe, CLICK HERE.